We are getting ready for an exciting event next Tuesday, September 10, at the Tech Mart in Silicon Valley (Santa Clara). 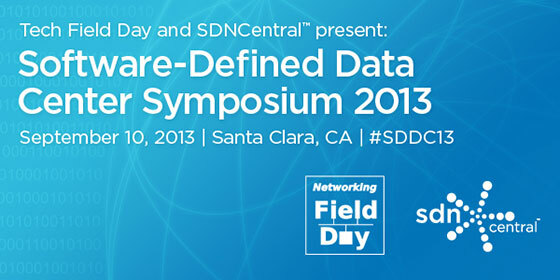 NEC Today followers who are unable to attend can view it live on this web site The Software Defined Data Center (SDDC) Symposium, which will be produced by Packet Pushers, SDN Central and Tech Field Day, and sponsored by NEC. This event was sold out shortly after being announced a month ago, and promises to be a real winner with a keynote appearance by Alan Boeheme, Chief of Enterprise Architecture at Coca-Cola Company, talking about how Coca-Cola is building SDDCs. Hosting panels on a variety of topics in the afternoon will be Jim Duffy, editor-in-chief of Network World, Greg Ferro of Packet Pusher fame, Ivan Peplnjak of iosHints (leading the panel on SDDC Architecture), and Tom Hollingsworth of Network Field Day and Gestalt Media. We are looking forward to hearing what all of these luminaries have to share! Presenting from NEC will be Don Clark, director of business development, who will speak beginning at 9:30 a.m. PST. Don will describe the role of openness, visibility and programmability in the Software Defined Data Center and how business that embrace SDDC are driving higher levels of agility and efficiency. Since the event is sold out, NEC has chosen to stream it live from this NEC Today page. So come back here next Tuesday at 9:30 a.m. PST to view Don’s presentation! Also featured on the agenda is Samrat Ganguly, NEC’s chief architect for ProgrammableFlow, joining a panel moderated by Ivan Peplnjak at 2 p.m. PST and discussing next-generation Software-defined Data Center Architecture. Finally, you won’t want to miss David Cheperdak, NEC ProgrammableFlow systems engineer, on a panel from 4:15-5p.m. PST as he discusses with colleagues, including Tom Hollingsworth, how applications are changing the way a typical SDDC is designed and implemented. NEC is pleased to invite you to the “Symposium after the Symposium” beginning at 6:30 p.m. at the Tech Mart. Join us for a discussion of the day’s events and findings. And be sure to check back here on Tuesday for all of the presentations streamed via live video feed! After delivering the first Windows 2012 extensible vSwitch for Windows Server 2012 Hyper-V, the ProgrammableFlow PF1000, NEC is continuing to collaborate with Microsoft for the benefit of Windows Server 2012 customers. For the first time at TechEd, beginning Sunday, June 2, in New Orleans, attendees will view a demonstration of a completely integrated NEC Software-Defined Network with Microsoft’s System Center Virtual Machine Manager, providing a single point of orchestration for both virtualized server and network environments. Microsoft’s System Center Virtual Machine Manager with NEC’s OpenFlow-based ProgrammableFlow solution provides streamlined network deployment and configuration, dramatically decreases operational costs and extends flexibility, control and automation across the network. 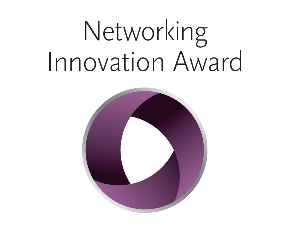 NEC will be leveraging its award-winning ProgrammableFlow® networking suite, including the PF6800 SDN OpenFlow-based controller, and the new PF1000 vSwitch, to enable complete network virtualization and automated, dynamic network management. NEC’s ProgrammableFlow networking suite adapts to changing workload needs by abstracting from the physical network, controlling data center traffic flows, and enabling integrated policies that span both the physical and virtual networks. The Virtual Tenant Network (VTN) function enables ProgrammableFlow customers to easily configure and manage isolated and secure virtual networks as required by many use cases. 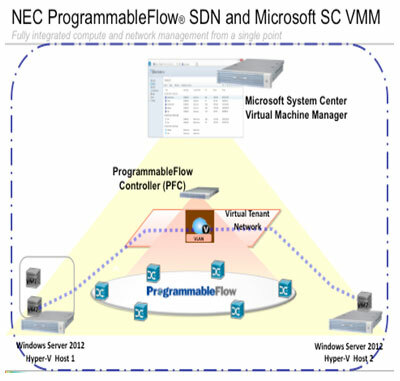 The integrated NEC ProgrammableFlow and Microsoft System Center 2012 Virtual Machine Manager solution promises benefits in four key areas: increased flexibility, control, automation and operational expense savings. While the integration with System Center Virtual Machine Manager is new, ProgrammableFlow is currently in production in multiple global and North American installations with documented results. From a flexibility perspective, the virtual network abstraction provides a new level of flexibility similar to what server virtualization delivered. In the past, physical networks could not be easily redeployed or changed. Complete network virtualization allows for virtual networks that can be easily modified and moved. This may be the use case that many seek when looking for Software-Defined Networking (SDN) solutions. Flexibility also results from ProgrammableFlow’s multi-tenant networking. The ability to isolate secure virtual networks to match business requirements is a new and exciting product of ProgrammableFlow’s Virtual Tenant Networking. New levels of control are enabled with the ability to set policies across the network – all from a centralized point. The ProgrammableFlow networking suite further allows for bandwidth control, and dynamic traffic control with network-wide Quality of Service (QoS) that allows customers to prioritize traffic across the network and mitigate or eliminate bottlenecks on key workloads or designated network flows. 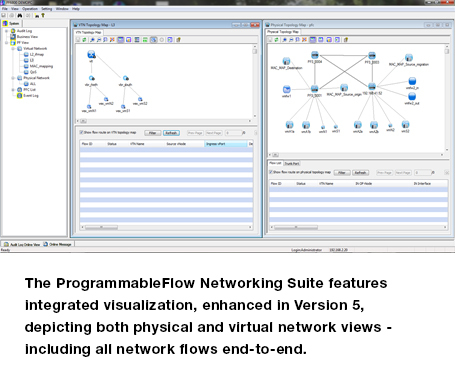 ProgrammableFlow network suite integrated with System Center Virtual Machine Manager delivers unmatched network automation. It enables customers to move VMs between physical hosts with business policy moving with the VM and routing of packets automatically updated – transparent to the administrator and to the user. As a further aid to managers moving virtual machines, end-to-end flows can now be viewed on the management console, providing new insight on network status. 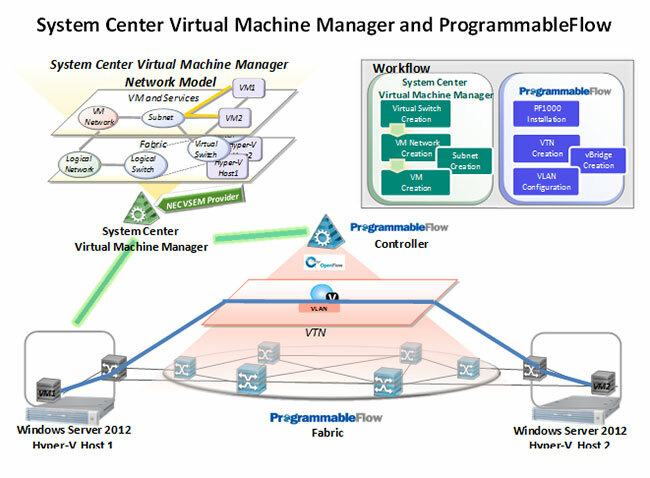 Dynamic, policy-driven network configuration and reconfiguration becomes increasingly important when considering the imperative of business agility, and System Center Virtual Machine Manager ties together these benefits when considering the control across hundreds or even thousands of VMs and their supporting networks. Reducing complexity and eliminating many manual tasks drive operational savings from the integration of System Center Virtual Machine Manager and ProgrammableFlow. Kanazawa University Hospital reported the deployment of software defined networking will produce operational cost savings of as much as 80%. Genesis Hosting Services is on record with a significant drop in network programming. Nippon Express looked at energy savings exceeding 50% over conventional networks, and last week SDN Central reported that NTT expected more than 50% OpEx savings from ProgrammableFlow SDN by the end of 2015. For more information on Software-defined Networking and NEC’s ProgrammableFlow, please visit our web site at necam.com/sdn. Also, register for TechEd or, to follow the proceedings, go to northamerica.msteched.com. 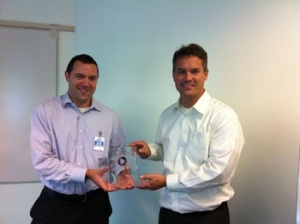 Jeremy Hurley, SearchNetworking.com Publisher, is shown here (left) presenting the Innovation honor to Don Clark, Director of Business Development for the ProgrammableFlow® Open SDN product suite. More than 400 engineering person years have been invested by NEC into this ground-breaking Software-Defined Networking solution, a commitment first begun in 2008 when NEC co-founded and helped fund The Clean Slate Lab at Stanford, the birthplace of the OpenFlow protocol. First to market with a complete programmable networking solution in May of 2011, NEC currently offers a third version of its award-winning OpenFlow-based PF6800 controller. In addition to the simplified and automated network originally introduced in 2011, Version 3 introduced end-to-end Quality of Service, scalability beyond 4,096 VLANs, advanced network automation and granular network management. And just last week NEC participated with 20 other vendors at PlugFest, testing and demonstrating interoperability with multiple vendors including Broadcom, Brocade, Extreme, IBM and Juniper.